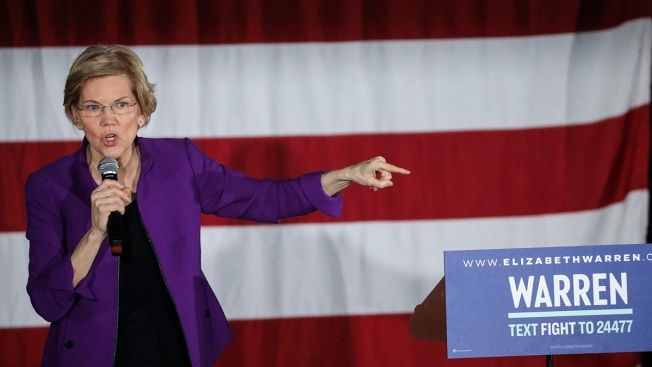 This March 8, 2019, file photo shows Sen. Elizabeth Warren, D-Mass., speaking during a campaign event in New York City. Facebook confirms to Politico that it removed some of Sen. Elizabeth Warren’s ads calling for its breakup. Warren says the removal is a sign that Facebook and other tech giants hold too much power. Facebook removed some of Sen. Elizabeth Warren’s presidential campaign ads calling for breaking up the social media giant but later reinstated them after Politico reported on the takedown. Warren’s ad was an extension of her call to “break up Big Tech,” which she announced in a Medium post published Friday. The Massachusetts Democrat wrote that companies with an annual global revenue of at least $25 billion should not be able to own a public online marketplace or platform and sell on that platform themselves. She also promised to take steps to unwind “anti-competitive mergers” including Facebook’s acquisitions of WhatsApp and Instagram. Warren said in a tweet that Facebook’s initial removal of her ads showed the platform’s outsize power.